beautiful - all are cool. 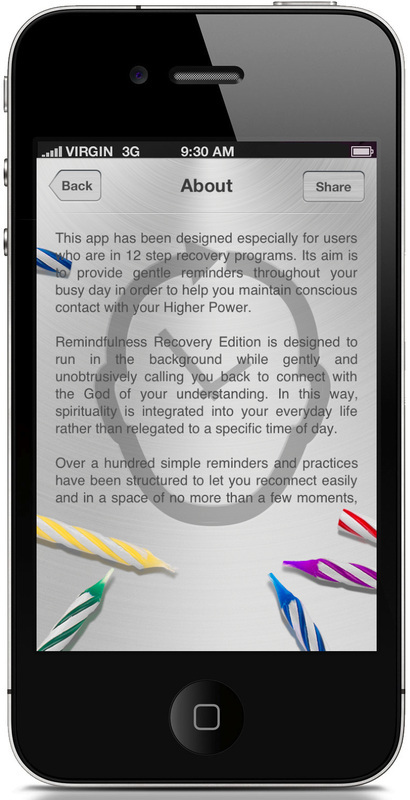 This app has been designed especially for users who are in 12 step recovery programs, with content by guest-developer Derek Sheppard. 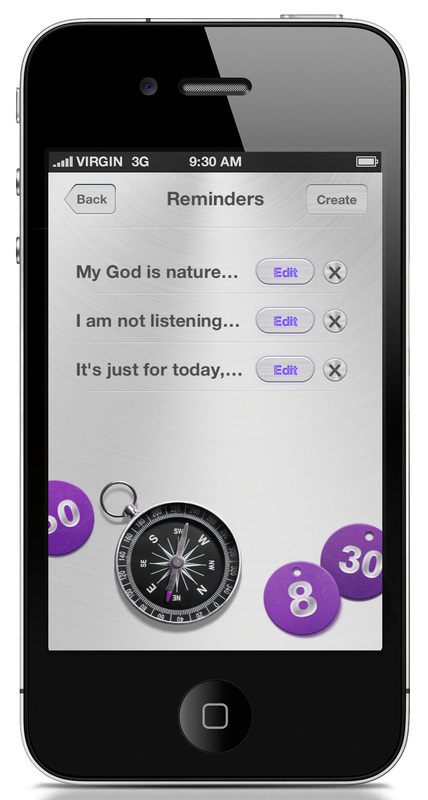 Its aim is to provide gentle reminders throughout your busy day in order to help you maintain conscious contact with your Higher Power. 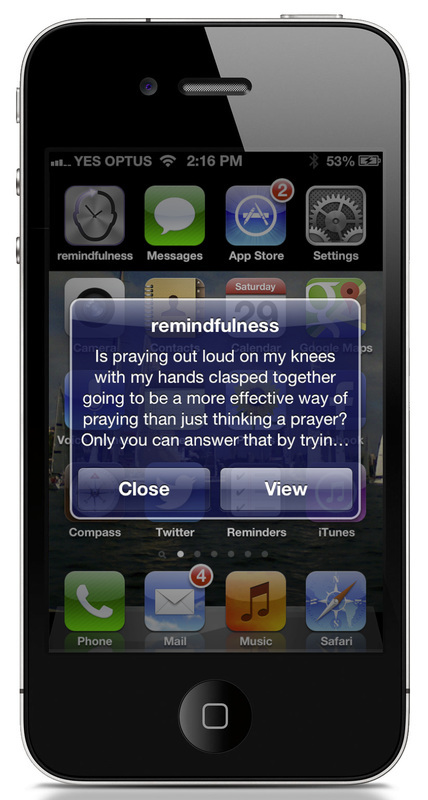 Remindfulness Recovery Edition is designed to run in the background while gently and unobtrusively calling you back to connect with the God of your understanding. In this way, spirituality is integrated into your everyday life rather than relegated to a specific time of day. The simple reminders and practices have been structured in a way that lets you reconnect easily and in a space of no more than a few moments, without having to physically move or even close your eyes. The random timings of the reminders will create synchronicity just when you need it, jolting you out of that head space that we all know can be so chaotic, back to the calmness and serenity that only comes when you are connected to your Creator. 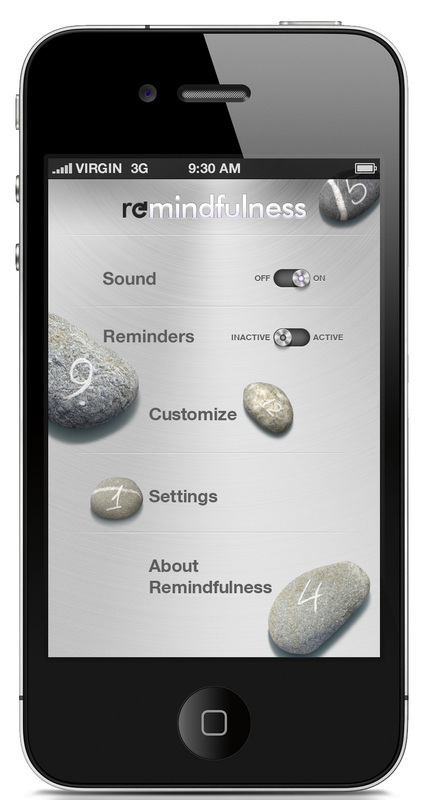 Customization features allow you to further control the way Remindfulness functions. You can choose whether or not to hear an alert tone when the reminders come up and to choose from several if you do. You can choose whether you want reminders to come randomly (and how many you want, if this is your preference, via the "frequency" setting), or at regular intervals from a provided selection. You can also suspend the app while you sleep at night, without quitting it, so that reminders don't light up the screen of your device and wake you. Please enjoy Remindfulness. It has been created to help you stay connected throughout the day, to return joyfully to the present moment. I hope it will become a useful and important tool in your recovery. About the images in Remindfulness - Recovery Edition: The stones on the Home screen are the stepping stones of the 12 steps. 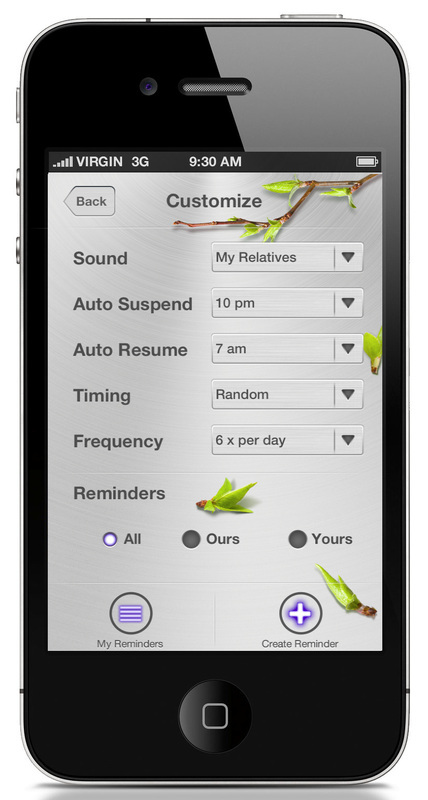 The buds on the Customize screen symbolize new life. The images of the Settings screen mean "Take it slow, one day at a time" and June 10th on the calendar page is the day Dr. Bob took his last drink. The candles on the About screen refer to the tradition of celebrating years in recovery with a "birthday". On the Reminders List screen, the compass symbolizes a new direction while the chips refer to the tokens given out at milestones in recovery. 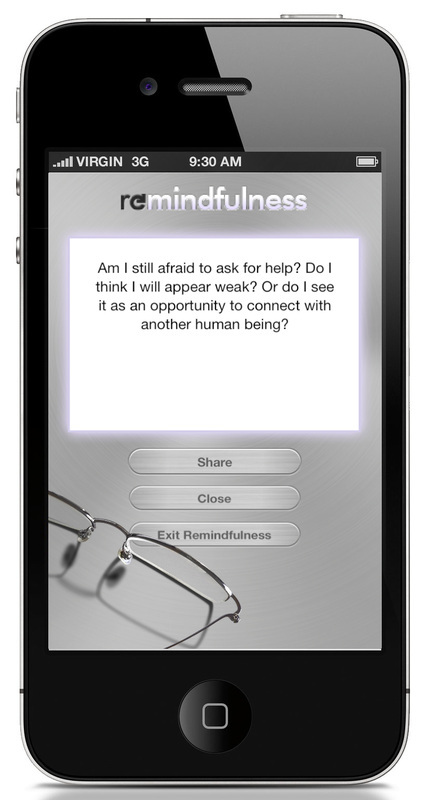 The glasses on the Reminder screen are a metaphor for the new way of seeing life that recovery offers.